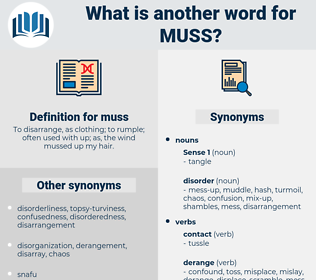 What is another word for muss? To disarrange, as clothing; to rumple; often used with up; as, the wind mussed up my hair. harmony, system, order, organization, calm. neaten, tidy, arrange, organize, straighten, fix up, clear up, soothe, smooth. Now, see here, don't make a muss; the commandant'll be down here in a minute. The only thing he can do is to go forward and backward, and if he happens to have Injuns in front and rear, you can understand what a purty muss he would be in. 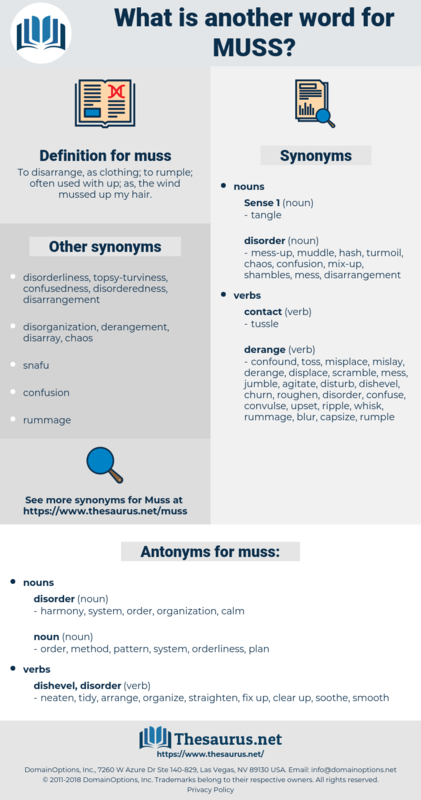 Mauna Kea, maxi, mask, meanness, mick, masses, mongoose, magic eye, misgauge, magus, misuse, massasauga, meiosis, mangey, mishegoss, missy, myosis, make, myaceae, mash, maize, mussy, manchu, monegasque, macau, monecious, mesh, monoecious, mm hg, mayacaceae, mag, momos, manic, monish, msg, musgu, masa, manioca, musk hog, much as, missus, message, mews, mousy, mazy, moses, muggee, Massawa, munj, mucosa, mummichog, Monoicous, manky, mickey, mosh, mace, macaw, moose, mucky, msc, manus, mcg, miss, mnemonics, minos, moss, mayaca, meg, mniaceae, musgoi, magic, meshuga, mousse, mimosa, maze, monaco, mousey, men's, musky, msasa, mayeng, mongo, mimic, mensa, mnemonic, myg, monkey, mujik, menses, muzjik, moke, monk, monomaniac, meniscus, minge, miscue, mosque, meshugaas, mus, mc, minkowski, magh, man jack, moksa, mouse, mange, managua, mawkish, monkish, menziesia, mushy, Manes, mojo, music, meq, musquash, much, masque, mx, myiasis, masai, mimus, mezuzah, max, mack, mahuang, mishegaas, mahagua, mike, mung, minimum wage, mycosis, mangy, moxie, muzhik, manis, Minimus, maguey, mecca, mensch, macaque, Mimamsa, mince, missis, Minnie Mouse, MEK, minsk, monas, musa, mix, munja, manioc, menage, mock, mass, Manichee, Meno Mosso, meaning, Micheas, messiah, meuse, ming, macho, musci, mimesis, meek, mohawk, musaceae, meshugge, macao, mimosaceae, maja, mansi, minacious, masse, mg, mwanza, muggy, Magha, manx, mayonnaise, ms, moussaka, msec, mezzo, mosey, mink, manse, muncie, mining, mons, minimize, make hay, musk, mesua, meninx, munjuk, mango, mucus, mesozoic, miwok, mush, majagua, musk ox, manque, Ms., massage, maikoa, mac, muzzy, menace, mosaic, miosis, moo-cow, means, MAK, mossy, mezuza, minimise, masseuse, mesic, manna ash, mug, munch, munich, mays, mexico, mannish, macaca, mooch, mach, mensh, musca, mess, mesa, muck, messy, mucose, meshugga, moschus, momus, moneses, moaning, mocha, mashie, mhz, maniac, minus, mica, MKO, mashi, muskogee, msh, minx, Micaceous, moscow, manage, moujik, maquis, mysis, mako, muse, MCIA, Micah, mingy, mucous, messuage, make way, meninges, magi.